Levine North-South Basketball game over 25 years ago. Lloyd on the left. The biggest basketball games of the year are starting. I’m pumped for Steph Curry vs. LeBron James, but the game I’m looking forward to even more will be at a family wedding in Virginia this Saturday. 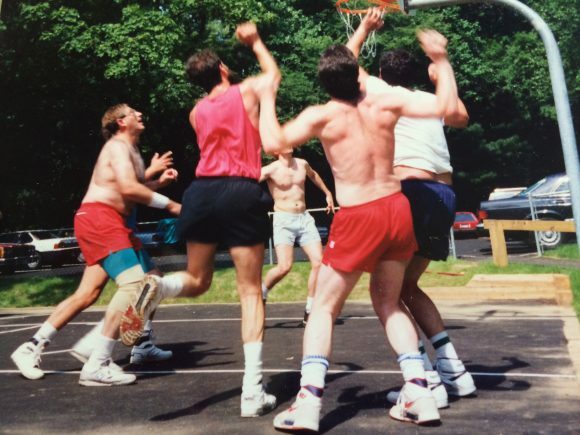 For the last 40 years, at almost every wedding or Bar Mitvah weekend on my wife Risa’s side of the family, the cornerstone of the event is the family “North vs. South” basketball game between members of the Levine clan. The natural rivalry is between my wife’s family from Charlotte and the other Levines from the New York area. The games started when Risa’s uncle Howard, who played college ball at Ciena College in New York state, wanted to match up his three sons against Risa’s three brothers and me. Risa’s other uncle in New York also had two sons who could play. Throw in other assorted invitees to the event and you had a game. Through the years, marriage and children brought more players into the basketball event. Kids games and women’s games also popped up. For my sons, playing in the men’s game was a true initiation into the family. To be accepted as a player became more important than the Bar Mitzvah or wedding. My sons got to play little cameos when they celebrated their Bar Mitzvahs at 13, but true manhood was bestowed when they were really accepted as basketball contributors, maybe when they were 16 or 17. You may be able to memorize scripture in Hebrew after a few months of preparation, but you can’t fake a jumpshot or a rebound. You do it or you don’t. Over time the pick and roll developed a significance surpassing all the rituals or parties. For me, the retina detachments I suffered starting in 2003 knocked me out of the games. I could shoot around before the start of play, but one-eyed jump shots don’t cut it in competition. I became a fan, cheering for the South team from the sidelines. It was one of those sad passages that tells you emphatically that your days as a competitive athlete are finished. It changed the way I looked at family events. They were no longer participation events. I was stuck forever in the older generation. I have gradually evolved into a fan. I schmooze with the other older guys and women on the sidelines and make astute comments about the proper strategy. It’s basketball. I love it. I’m passionate about it. I still dream about my playing in high school and images of layups with the imagined sound of the caroms helping me to go to sleep at night. I’ll watch the Cavs-Warriors games avidly, because basketball is nirvana for me. The corner jumper swished from 20 feet is the sweetest sound in the world. This weekend I’ll watch the 2016 incarnation of the family-ball confrontation. It’ll be fun, the bonding will be a joy. I know I’m now a member of the Levine Basketball Hall of Fame. In my creative memory I can shoot it like Steph Curry and bang like LeBron. Just ask the other 60-year-old guys who will be cheering the third generation players on. Question: Do you look forward to or dread family reunions? Interesting that you should ask this question now, as my family gears up for their annual 4th of July croquet tournament. This is 4 courts, seeded, double elimination tournament croquet, where the awards are purchased at the 5 and dime, and where practicing is considered “cheating”. My son-in-law married into the family about 10 months ago, and he already knows to pack his most garish red white and blue outfit when he travels to Wisconsin, and that trash talking is an art. I love family reunions. We’ve found a way to compete without taking ourselves too seriously, and love seeing each other. Can’t wait until the 4th!